This wasn’t a great start for my post, since I really really couldn’t think of an appropriate image….I didn’t think a picture of my arm was suitable! Today I am going to share with you my experience with the contraceptive implant. I have been seriously umming and ahhing about whether or not I should upload this post, and whether it is appropriate for the content of my blog. (if you are reading… sorry dad!) But in reality, talking about contraception can only be a good thing, in fact a very safe thing indeed! Plus after speaking to a few girls, they thought that it would not only be an interesting read, but potentially very helpful for those trying to make a decision on a contraception choice! So here we are! Just as a little side note, I am no means a professional in this field, I am merely talking about the experiences I have had with the Nexplanon Implant myself over the past year, as well as a little bit of knowledge I have. However, you always have to speak to a healthcare practitioner anyway before having the implant fitted, in case for any reason you are not suitable for it. 1 – The implant doesn’t protect you from STI’s – so still keep that in mind. I thought I would share with you the background behind why I even considered getting the implant in the first place. Also to kind of demonstrate that I think getting an implant is something that should really be thought about a lot, and definitely not a spontaneous decision – let me remind you, you are getting something physically put into your arm! So basically, like a lot of girls my age. (I imagine) I have quite a large phobia of becoming pregnant. The entire thing terrifies me. I worry about it a lot more than I should, and a lot than anyone I really know – I only really noticed this in 2013 during my first year of University. After going to the doctors they decided it was best that I go on the pill, which at first was absolutely great! But then after a few months or so… I don’t really know what happened, potentially to do with the hormones, or something but the thoughts that were going through my head just were not right. I had even started to convince myself that I could get pregnant in so many situations, usually without any sexual contact at all. This obviously is completely irrational and SCIENTIFICALLY impossible, but it still wouldn’t leave my mind. Not exactly the best way to begin a relationship! I started to panic about taking my pill. If I didn’t take it at 7.45am on the dot I would freak and shake and just be terrified. Then the fear of ever ‘forgetting’ to take one took over my life. All I can say was my pill free week was always the best week of my life back then, even whilst being on my period. The days I had 9am lectures – I would usually be fine, but the days I had to set my alarm specifically to take my pill became a living nightmare. I downloaded an app, which was truly incredible actually, where you could tick that you had taken your pill and it would also have a time stamp for when you took it. This helped out A LOT but then even this started to not be enough. I began to take a screenshot of the time on my phone, take a picture of the pill packet before and then a picture after to show it had been taken, and then also a screenshot after of the time. It was totally exhausting. (I also started to get really defensive with my phone, for the fear that people would see these photos and be like what Kayleigh?) You would think that would SURELY be enough? But no, there was that little voice in my head mocking and laughing at me telling me I was pregnant. Because of my relationship with the pill obviously not being amazing, the anxiety I suffered when taking it was horrendous which made swallowing it extremely difficult even though it is TINY. It turns out I am definitely a “what if kinda girl” and there were LOTS of what ifs swirling around my mind. The one that occurred the most was the fear of it not being swallowed or potentially falling out of my mouth… apparently very common thoughts. On the days that I questioned if I had taken it, I would start to take extra pills to be sure, sometimes three a day. This is NOT healthy and I strongly recommend you don’t do this. I would constantly have ‘the symptoms’ of a pregnant woman. I always felt bloated, constantly needed a wee, all sorts. Plus, never ever ever ever, google anything to do with symptoms, or anything actually to do with healthcare, go to the doctors! Google diagnosing honestly ruins happiness. The minute I read that having a period doesn’t necessarily indicate that you aren’t pregnant really destroyed me. I cannot explain the amount of pregnancy tests I went through… my poor pennies! The number of doctors visits I had for reassurance that I was not going to be pregnant was RIDICULOUS. It would be rare for me to go over a week without going. They pretty strongly, advised I get the implant fitted, but I was completely utterly terrified of the idea, however I told them I would look into it. After LOTS of scouring of the internet, and freaking out at SO many negative horror stories (please try to ignore them) about the implant I looked into other contraceptive methods such as the patch, and the injection. All three of the contraceptions have their positives and their negatives, and I think that is where it came down to my own personal decision really. So I booked my appointment! But it is up entirely up to your preference. I COMPLETELY understand why you wouldn’t want an implant. 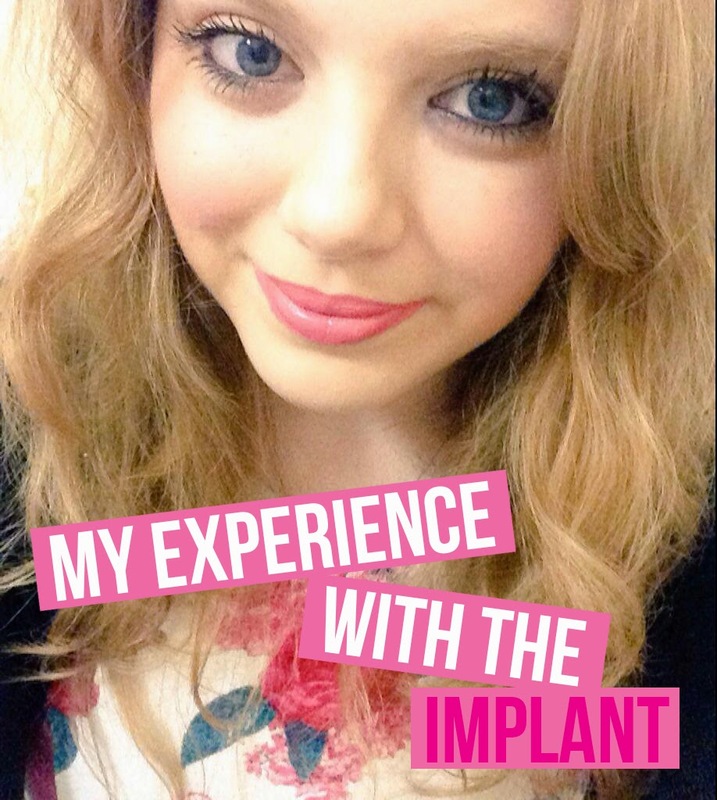 So there we have it, I felt it was good to explain why I initially chose to get an implant, and as you can probably see, I very much needed it…. I get asked about this A LOT. I feel this is an important part of this blog post, because knowing this, could potentially really really help make a decision on whether you want to brave the procedure. (I WISH I could have had this blog post to read….) I find I have a fairly high pain threshold, but honestly this didn’t hurt at all when they fitted it. In fact, the injection was the most uncomfortable part of the entire thing. I even asked if she could warn me when she was about to put it in, and she was like oh I have already done it! It was quite surreal really! They then bandage you up and you have to keep it on for a few days, and yes this was quite a pain. I would be lying if I said it doesn’t hurt after the injection wears off, and you do get quite a lot of bruising, but it soon wears off! They gave me a few things to read over. I believe I had to still finish off my current pill packet, I am not sure what happens if you aren’t on the pill – but do ask at the doctors! So, you may or may not know some of the side effects that the implant typically has. Mostly from my friends I have heard that your periods can completely stop – and to a lot of people I know, this is something that is often quite desirable! I didn’t actually want to lose my period, but it was a risk I was willing to take to get out of the pill nightmare. The other thing that may happen is completely the opposite and your periods can become extremely irregular. I have had mine fitted for just over a year now and I do still have my occasional pregnancy thoughts, but NOWHERE near as strong as whilst I was on the pill. I used to envisage it snapping, but that has passed, I have learnt that I just need to trust it is doing it’s job. There is no point in worrying because I don’t have to do anything, it is just there in my arm, doing it’s own thing, and I am living my life happily. Thank You SO MUCH if you have read through this monster of a blog post, but if you have, I like to think you found the content interesting! I really do hope this will help on deciding whether or not the implant is for you. If you have an implant do share your experiences below or if you have any questions and you would like to contact me directly at veryberrycosmo@gmail.com I would be more than happy to assist, especially if you have had any similar nasty thoughts. – I do honestly think it is an amazing contraception, it has truly changed my life. However, after saying all this, I would absolutely love to have a child one day, just not for quite a few few years yet! Previous Post MY LIFE | 33 Facts About Me! I always think about the implant i'm scared of getting pregnant too and i'm 23 and in a loving relationship.. AHH! I think now I would consider it more after reading your post, glad you opened up about it mrs and i'm sure a lot of other girls would too! Great post! I'm exactly the same as you, I'm a complete worrier about everything, even when I get my period I'll be googling anything and everything that happens in case there's something else that's not pregnancy, except I'm scared of the doctors so even if there is something wrong I wouldn't do anything. The implant sounds like a great option, just think the month long period would sway me away from it! Haha i'm 22 and I definitely do not want to be pregnant and if that happened now the abortion experience terrifies me, don't want to put myself through that but yeah i'm on the pill and I do like it don't think I could ever see myself going on the implant because of the insertation process cause i'm such a wimp god help me when I do eventually go through child birth ! This post has been SO helpful, thank you! I've been umming and aahing about the implant for about half a year now. There are still things that worry me about it but I think I'll definitely go at least for a consultation with a doctor about it! Such a helpful post – I also hate having to take a pill each day and had gotten so forgetful of it that I've now come off it completely and feel so much more relaxed. Not sure that I could cope with the unpredictability on the implant though, I'm a bit of a control freak with that and like to know exactly what's happening each day of the month! Love this post! I've had the implant for a year and a half, best decision ever! All that worrying over having it put in for nothing, it wasn't as bad as I thought it would be! I am a tad worried about getting it changed but that will soon leave me when I've done it! Amazing post that will definitely help sooo many girls make the right decision for them. I'm on the micro pill and it's perfect for me. I watched the 'GP'S behind closed doors' programme and a girl was having her implant changed as the 3 years were up and I literally passed out just watching it! Definitely not for me right now as I am a massive wimp when it comes to injections and especially in that part of my arm. This was such an interesting post! As a medical student, we do a lot of learning about the various options and the potential risk/benefits, but it's rare that I get to really hear so honestly from a normal woman's perspective about why she choose a particularly option of contraception! Great post. Glad I saw it pop up on my Twitter feed. I am on my 3 rd implant. First two I just gained weight and suffered Rome iregular periods and migraines from time to time. However my third has been placed so close to my muscle it can sometimes irrate my skin. My advice would be if you have this fine make sure you are happy with where it has been placed. Lovely post, thanks for sharing! I just got mine replaced last month after having it for the full 3 years! Over the 3 years I had a generally positive experience. The only bad thing about my experience was that for about the first 3ish months and then the last 3ish or so months, I constantly had a period/was lightly bleeding and so obviously wasn't great! In between them though I was generally fine, I would usually have a normal period about every 3 months. I'm not on my second implant and it's been ok so far. I have been taken the pill along side it though as I did say that I had had a problem in the last few months and when I first initially got it. With this I so far haven't had any bleeding (although I have had one week of from the pill so far). But have still had *some* pains this past week or so. But in general it's been fine over this past month of having my second one. No discomfort or anything! Ohhhh…. also I got the implant without having been on the pill or anything before hand. They basically said I was good to go, but because of paranoia I did make other precautions for the first week or so just to be on the safe side! This is a brilliant post! I really think this will help lots of people who are considering the implant. I got my implant a few months ago and I know exactly what you went through, so I feel glad that someone else went through the same thing as me. This is a great post! I have been thinking about getting the coil though (I have really bad periods, and I tried out the Pill and it wasn't god for me at all). My doctor suggested the coil but I am scared of having the procedure done – because of the pain, side effects, etc. I am a bit of a worrier and I am very risk averse so that's why. Hi. Loved this post! I have three kids now (got pregnant twice whilst on the pill) and I've had the implant for two years now (ooo didn't realise it was that long haha) I heard tons of negative reviews about it before having it done, but after taking the pill for 5 years then being pregnant really freaked me out! So far so good, I do get a week or so when I get period 'symptoms' such as chronic cramps & bloating, but I think for the past two years I havent had a period that's lasted longer than a day or two, though they won't be regular and like you are every 3 months or so.